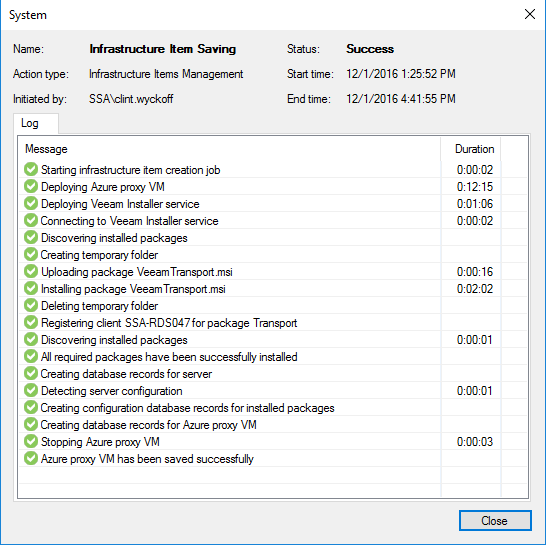 Veeam Direct Restore to Microsoft Azure: How to Deploy the Azure Proxy Server? 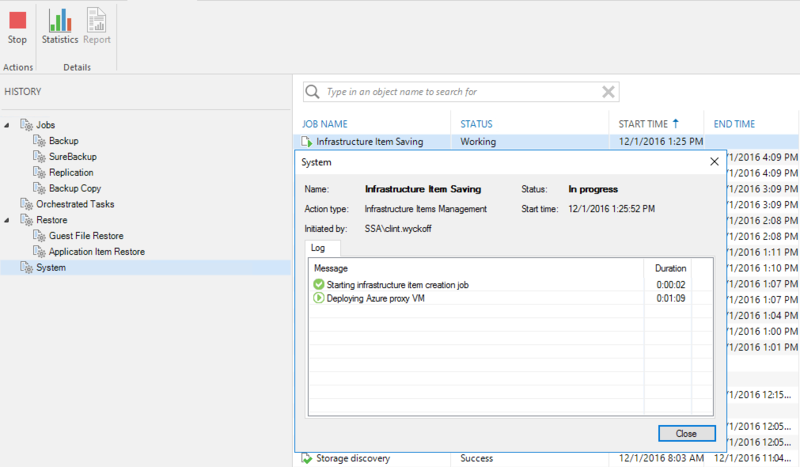 Veeam Direct Restore to Microsoft Azure: How to Deploy the Azure Proxy Server?Within the Veeam Backup & Replication console you’re able to now directly recover VMs of any Veeam type including, VMware, Hyper-V, Physical or Endpoint directly out to your Microsoft Azure environment. 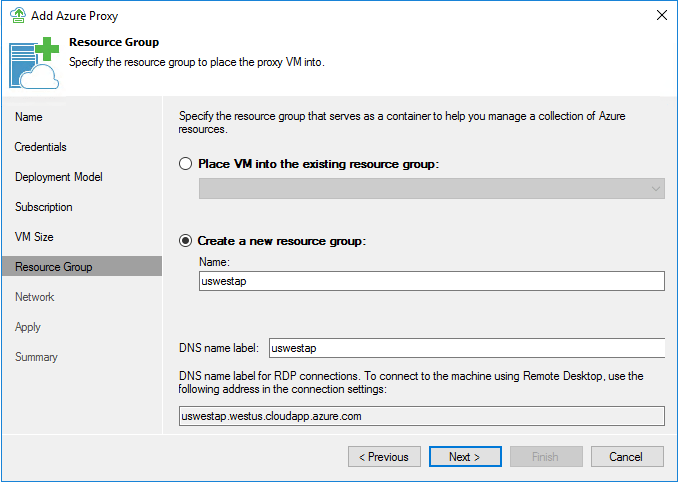 In my previous post, How to Setup Veeam Direct Restore to Microsoft Azure, I detailed all of the steps required to make Veeam Backup & Replication 9.5 aware of your Azure Subscription. This process is required before moving forward with the restore process which we’ll begin to dive into here. There are many variables that can play into the actual Recovery Time Objective whenever you’re recovering data out over a Wide Area Network (WAN) connection. The largest variable there being the network connection. 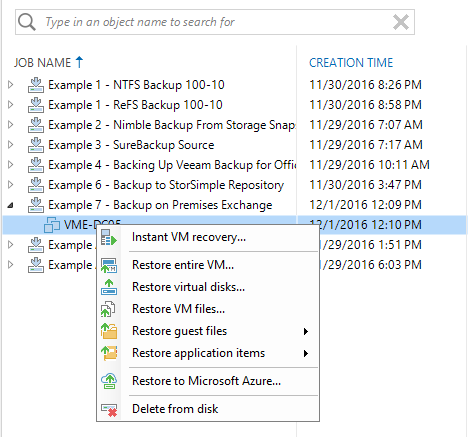 Veeam customers are already familiar with the concepts of the Backup Proxy. In distributed environments where data is being sent over a WAN connection from one data center to another it is a best practice to deploy at least one backup proxy server in the source site as well as at least one backup proxy server in the target site. The scenario of restoring physical and virtual machines from backups residing in the on-premises environment to Microsoft Azure is very similar. The purpose of the Backup Proxy servers on-premises and in Azure is to compress and deduplicate the data. This will help to reduce the amount of network traffic and then in turn increase the speed of the restoration process. In your Azure environment if you utilize multiple Azure data centers – for instance US East, US West and Australia East, you should deploy an Azure Proxy Server in each data center. The process of deploying an Azure Proxy server is completely automated and very simple to complete. Lets take a look at the steps and dive in a bit deeper! The Azure Proxy server is deployed as a pre-configured Microsoft Windows Server 2012 R2 virtual machine within Azure that is left powered off until the restore process is initiated on-premises. Within Backup & Replication navigate to the Backup Infrastructure tab and right click on Backup Proxies – Choose Add Azure Proxy. Give the Proxy Server a meaningful name. I like to include the Azure Data center in my proxy server names. Just note that you cannot have any special characters in the proxy server name. 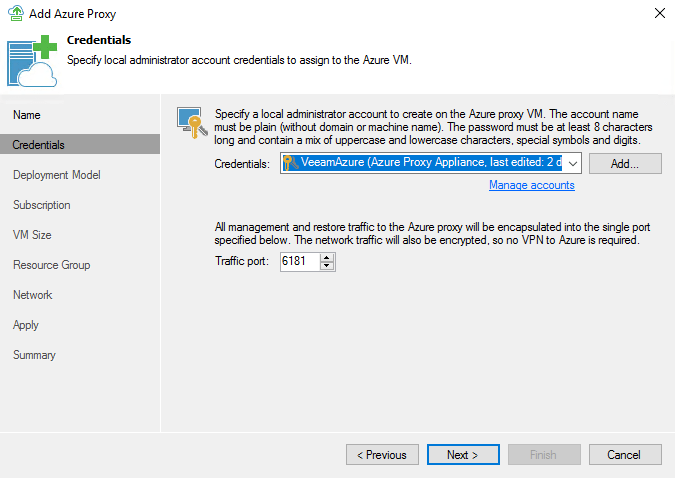 Next you’ll need to specify the local administrator account that you will use to connect to the VM inside of Azure. Veeam utilizes port 6180 to connect out to Azure so you’ll need to make sure that port on the firewall is opened or specify a different port. 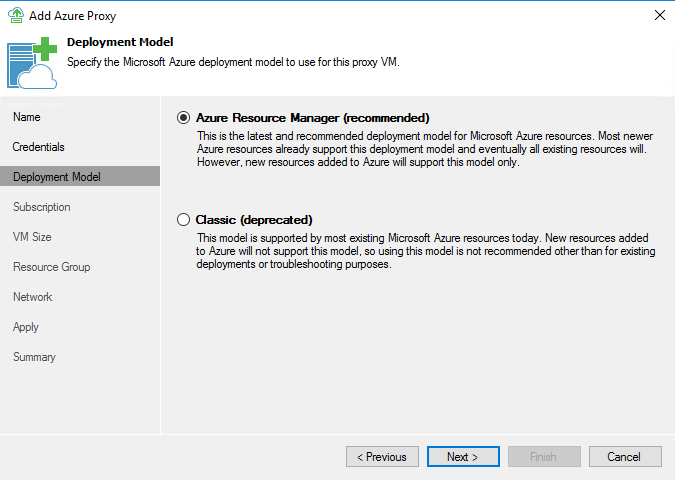 Next choose your deployment model- Recommended is the Azure Resource Manager as the Classic model is being deprecated and should no longer be used! Previously we added our Azure Subscription details. Here is where we begin to leverage those credentials. 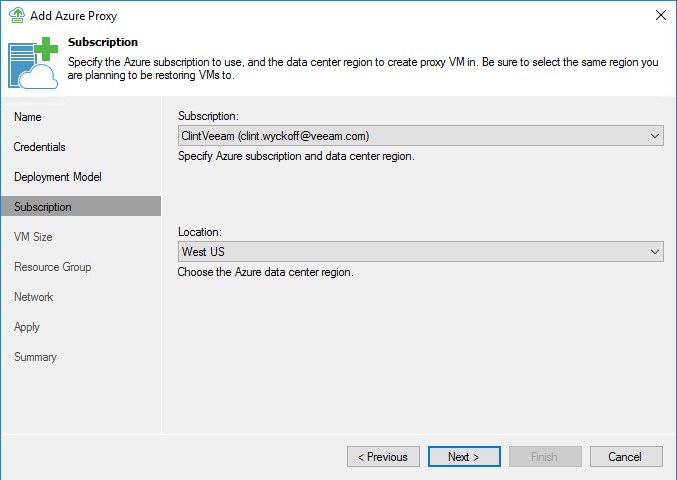 Pick the corresponding Subscription as well as your appropriate Azure data center region. Next choose the size of the VM. In my testing I’ve been fine using a Basic_A2 and have not experienced any problems. However, if necessary you can select a larger sized VM. Also choose the storage account in which you would like to have the hard disks for this VM stored. The Resource Group selection step allows you to specify either an existing Resource Group or to create a new one. By default the Create a new resource group radio button is selected. In the new resource group, Veeam automatically creates the necessary network security group, public IP address as well as the network interface. You can however alter the public DNS name. The last step in this process is to specify the virtual network and choose Next, Finish. Here you will see the Infrastructure Item Saving status window. If you accidentally close this window, navigate to the History and choose System Jobs. 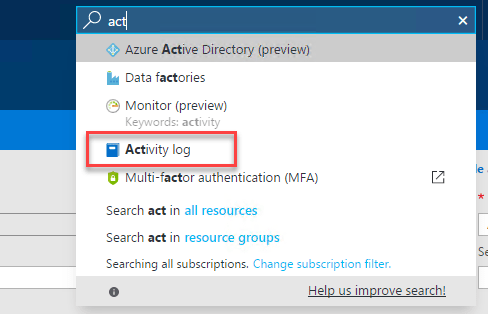 Within Portal.Azure.com, you can view the Activity Log. Filter by Last Hour to see all operations that have taken place. Once the view refreshes you will see several operations taking place as the VM within Azure completes. Once the Deployment of the Azure Proxy Server completes, click close. Within Azure we now have our completely deployed and Stopped (Deallocated) Veeam Azure Proxy Server. If you plan on restoring to Microsoft Azure you should definitely consider the Veeam Azure Proxy Server as must to deploy. It will save you time and bandwidth on the restoration process. 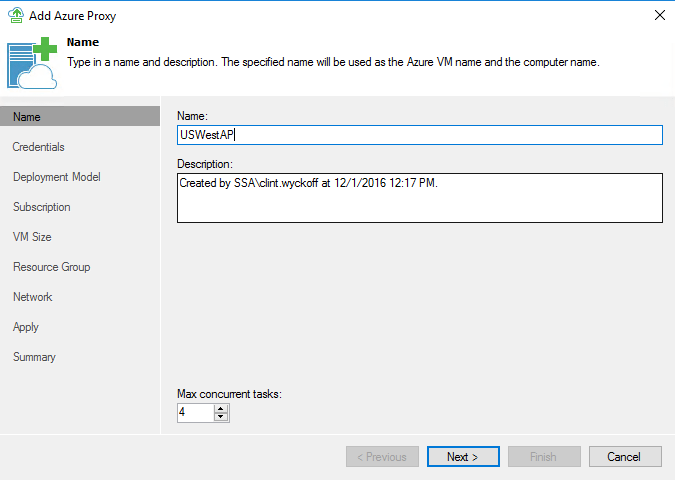 Using PowerShell to Query WMI to Locate vSphere and AHV VMs! 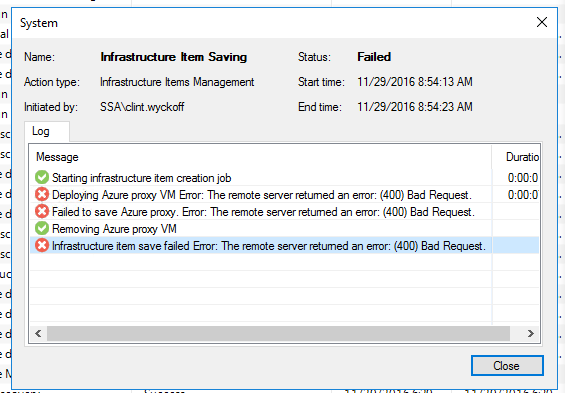 I found this page from a google search as I was getting “The remote server returned an error: (400) Bad Request” error using the Add Azure Proxy wizard in Veeam 9.5u2. 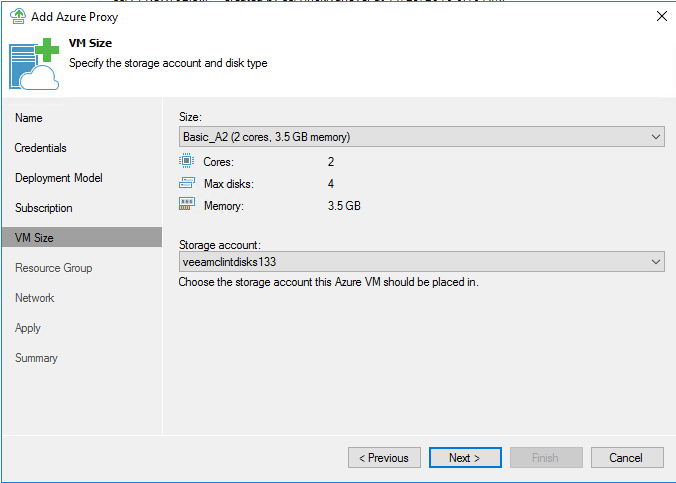 Because I was deploying the most basic VM configuration (as recommended by Veeam) but had chose a premium storage account, these settings were not compatible. I created a new storage account of type ‘standard’ and used this for the proxy VM. Thanks Michael, glad the blog was a help.